Summer is upon us and that means staying hydrated. We try to be as eco-friendly and eco-conscious as possible at the studio, but sometimes drinking a beverage from a plastic container is simply unavoidable. Remember to recycle, but you can also repurpose and reuse those water, tea, and soda bottles into creative and colorful "Forever Flowers". + PLASTIC BOTTLES Any size plastic beverage bottle can be repurposed. 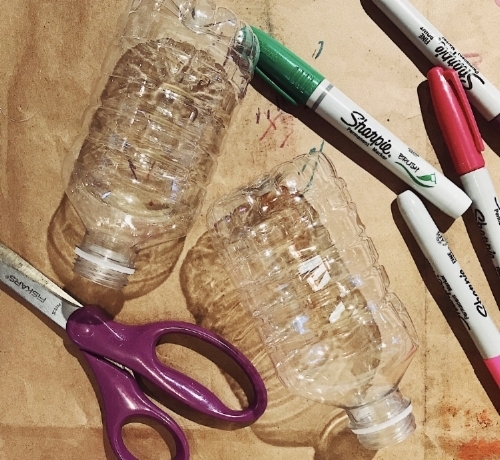 Explore using 2 liter bottles to create some seriously ginormous flowers! + PERMANENT MARKERS Let's talk about Sharpie permanent markers. All those "bold to the max" colors are ridiciously motivating and inspiring. 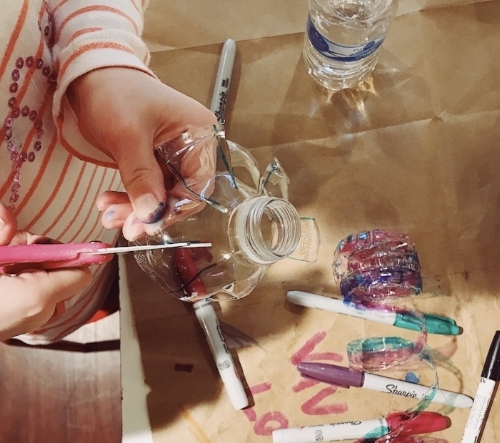 Even the youngest artist can use Sharpies, I'm a huge advocate for allowing children to use real tools (permanent markers, hammers, nails, glue guns, needle and thread) during supervised creative experiences. Children learn that we view them as competent and capable, they learn to work carefully and responsibly, and they learn that what they are creating with their tools has value. For this project, adding color to the plastic petals with ease using Sharpie Brush Tip Markers. 1. After removing any labels, cut the plastic bottle in half. Sometimes it helps to squash the bottle into a flattened shape in order to cut through from one side to the other. PRE-SERVICE EDUCATORS/CLASSROOM TEACHERS & PARENTS/CAREGIVERS : If you'd like to incorporate a cross curricular component, this is a wonderful way to introduce/review math concepts (students use a marker to divide the bottle in half to create equal parts). Feel free to experiment cutting the bottle to create larger and smaller parts as well, which students can compare (how are the parts the same/describe what is similar) and contrast (how are the parts different/describe). 2. 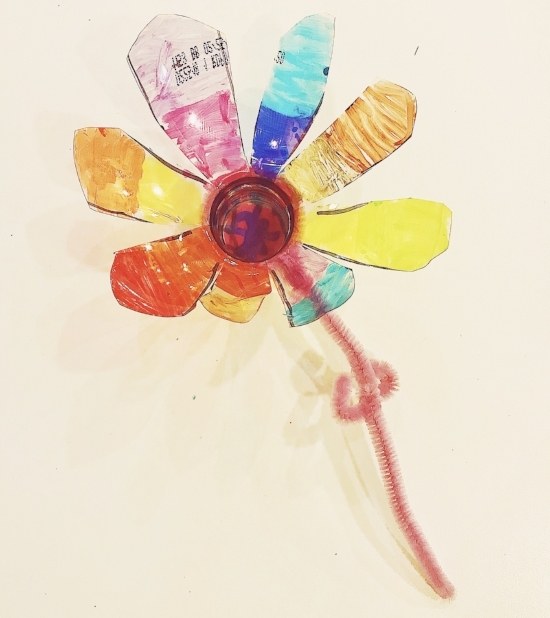 Both halves of the plastic bottle can be repurposed to create flowers (one bottle = two flowers). Begin with the top half and draw lines with permanent marker from the cut edge to the neck of bottle. Work your way around the plastic, drawing lines that are approximately two fingers width apart. Follow the line "roads" with your scissors and cut carefully. 3. As you complete cutting the drawn lines, begin bending the plastic "petals" out and finish with a pinch at the point where the "petal" meets the bottle's neck. The plastic has a "memory" and pinching prevents the petals from keeping the shape of the bottle. If desired, snip the ends of the petals into points or rounded edges. 4. You're ready to color! Add beautiful patterns of lines and shapes to the surface of the plastic (either side can be colored with markers). Create a flower for a special occasion or your favorite season. PRE-SERVICE EDUCATORS/CLASSROOM TEACHERS & PARENTS/CAREGIVERS : Assess visual art concepts by allowing students to chose their favorite color family for their Forever Flower ("How can you show a color family?" warm, cool, primary, secondary, analogous, etc). With the youngest of students, have them "Name that color" as they choose markers. Use your imagination and enjoy the process! 5. Repeat steps 2-4 for the bottom half of the plastic bottle. You'll find the plastic will begin to get thicker towards the base of the bottle, end the cut lines just as the side of the bottle meets the base. ~ OR ~ forego creating a second flower and use the bottom half as a vase! Color with permanent marker and add sand/pebbles/beads/soil for your Forever Flower. 5. (optional) Add a stem with a pipe cleaner/chenille stem by wrapping around the bottle's neck and securing with a twist. Tissue papers and construction papers make fantastic leaves, add to the stem with a dab from an Elmer's glue stick. To attach a stem to the bottom half of the bottle, hot glue will be your best bet (save all those old brushes for sturdy stems).